Behind elegantly finished and closed doors, the Sauder Computer Armoire - Cinnamon Cherry is all about getting the job done. When the work day is done, close the doors and you have a stately armoire that can fit easily in with almost any decor. A warm cherry laminate covers a robust body of engineered wood joined by sturdy hardware designed for everyday use. Inside, you'll find three adjustable shelves, with a dedicated lower storage area that will easily fit most CPU towers. A slide-out shelf gives you room for a keyboard and mouse, with enough shelf-room left over for your monitor, speakers, and some additional storage as well. 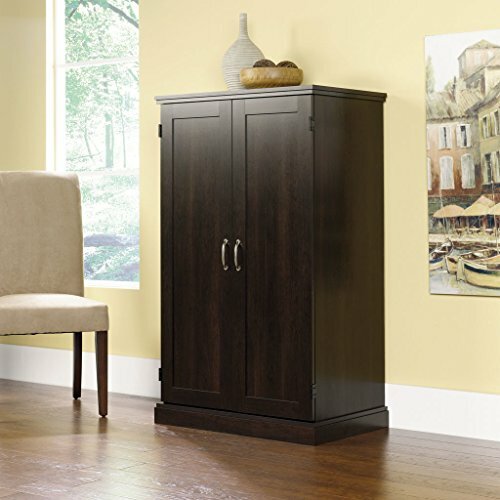 This functional armoire weighs 120 lbs., and requires assembly.